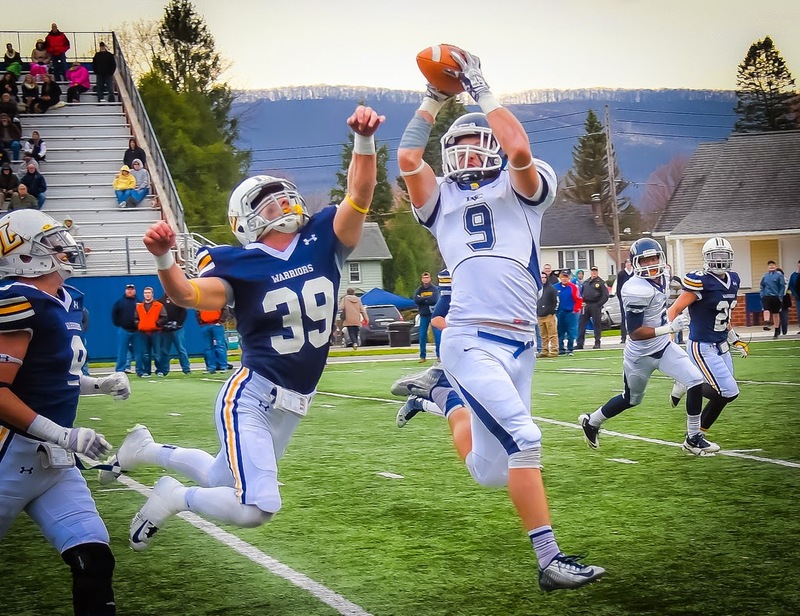 WILLIAMSPORT, Pa. - Lebanon Valley lost an overtime heartbreaker at Lycoming, 30-29, in a thrilling back-and-forth battle between the 2013 MAC co-champions. Billy Powanda scored four touchdowns and Brendon Irving ran for 184 yards, but the Warriors (7-2, 6-2 MAC) got a 411-yard, four-touchdown day from quarterback Tyler Jenny and a key blocked PAT in overtime to escape with the win. Irving became the seventh Dutchman to cross the season 1,000-yard mark, and Powanda tied the school record for touchdowns in a game. Lycoming air attacked produced a 228-yard, three-touchdown day for Ryan Umpleby, but the Dutchmen managed to hold feature back Craig Needhammer, who ran for 239 yards a week ago, to only 34 yards on 16 carries. "I'm really proud of them, I thought they played a heck of a football game," said head coach Jim Monos. "We made big plays, they made big plays - but they made more. It's not one play that costs you a football game. Our football team played their hearts out." The match-up of the 2013 MAC co-champs didn't disappoint as both teams went at it in a different way. Lycoming aired the ball out for 411 yards while being held to 82 yards rushing; the Dutchmen hit the ground for 297 yards and all four of their touchdowns. "It's a great rivalry between two good football teams," Monos said of the series with Lycoming, which is knotted 5-5 over the last 10 years. "We're going to have to try to bounce back and try to beat a good Albright team." Trevor St. Clair was the defensive star with a fumble recovery, a key fourth-quarter interception that led to a touchdown, and a PAT block. Zach Wierman and Ricky Feggins each had interceptions, and Andrew Livingston made six tackles with a sack. Frank Gaffney led all Dutchmen with 10 tackles. Devon Flynn's field goal from 23 yards out was the first quarter's only score for Lycoming, but LVC quickly got on the board in the second. Irving broke free for a 38-yard gain from midfield, and after Seth Miller caught a critical fourth-down conversion, Powanda blew through the line for his first touchdown to lead 7-3. Two series later, Jenny found Corey Talerico for a 15-yard score to retake the lead, 10-7, just before halftime. Matt Smoluk's field goal from 22 yards made it 10-10 to end the third quarter, and that set off a wild fourth for both teams. On their second series of the quarter, Jenny was intercepted at midfield by St. Clair, who appeared to have the pick-six with no one to beat before a flag brought it back. Still, it was LVC's possession, and after Brendon Irving ran for gains of 49, 10, and eight yards, Powanda punched in again to give LVC a 16-10 lead after a missed PAT. On their first play, Jenny found Umpleby for a 67-yard score but Lycoming also missed their PAT, knotting the game at 16-16 with 7:24 to go. Canceling interceptions by Michael Ward and Wierman put LVC at their own 26, and the Dutchmen marched downfield - keyed by Tyler George's 41-yard route to the sideline - to set up Powanda's third touchdown and the 23-16 lead at 2:10 left. The home side wasn't deterred, however, as Jenny completed five straight passes, the final one a 20-yarder to Umpleby, to tie the game and send it to overtime. In the extra period, Irving ran for gains of four and 20 yards to get the ball on the one, and Powanda dove to the left to score. Shaviah Coleman blocked the PAT, however, opening the door for the Warriors, who scored on the first play of their turn thanks to Umpleby's 25-yard catch. Flynn's PAT was good for the win. LVC will finish out the season Nov. 15, hosting Albright at 1 p.m. at Arnold Field.